Perfectly balanced metallic linen edged with a glittered center band make our new addition a must for all your holiday designs. 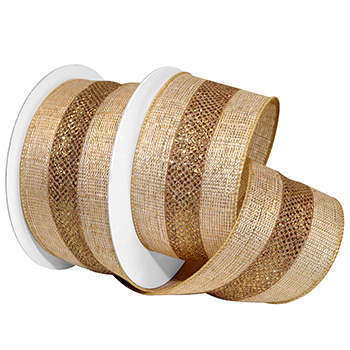 The Gold/Gold has the trending Champaign look and is equally beautiful woven into golden bridal theme creations. Exquisite and modern Regal Linen is an simple yet elegant accent to wreaths, holiday trees, packages and more!